Baby hurt in rocket strike: Four people were injured Friday after a Qassm rocket fired from the Gaza Strip hit their house. Osher Amar, a one-year-old baby, sustained light wounds, while his father Yuval and his uncle Yitzhak suffered light to moderate injuries. Initial reports said the infant sustained serious wounds, but hospital officials said he was hurt by the falling ceiling and apparently did not suffer any cuts or shrapnel wounds. The baby's mother suffered from anxiety and was taken to hospital as well. A short while later, two more Qassam rockets landed in the area. One Qassam damaged a structure in Ashkelon's southern industrial zone. Responding to the attack, Defense Minister Shaul Mofaz said Israel will not tolerate this incident, and vowed the country will respond. Meanwhile, IDF sources said the army will offer a "harsh, extended response" to the strike. IDF forces directed artillery fire at northern Gaza Strip areas used as Qassam rocket launching sites. The wounded infant was evacuated to the Soroka Medical Center in Be'er Sheva in serious condition and immediately rushed into the trauma unit. Doctors sedated the infant, who also underwent a CT scan. The father and his brother-in-law were taken by ambulance to Barzilai Hospital in Ashkelon. 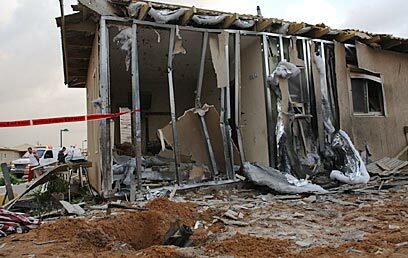 The Qassam hit the carra-villa (luxury mobile home) in which the three were staying in kibbutz Karmiya at the time of the attack. The 30-year-old father and 28-year-old mother are Gush Katif evacuees who in recent months lived in a mobile home neighborhood at the kibbutz along with other former Gaza residents. Following news of the attack, many concerned family members rushed to Soroka hospital. A Magen David Adom ambulance service paramedic dispatched to the scene discovered the baby hurt in the attack is his grandson. "The Qassam fell right in the middle of the cara-villa," said the paramedic, Yossi Cohen. "It made the parents and baby fly. When we arrived they were lying on the floor." Another paramedic, Koby Zeltzer, treated the baby and said: "The child was hurt in the forehead and nape. Such injury can lead to internal bleeding and cranial pressure. We'll be able to know the baby's condition with certainty only following a CT scan." In the last two weeks, the IDF refrained from responding to Qassam fire from Gaza and also avoided resorting to artillery fire at rocket launching sites. However, Defense Minister Shaul Mofaz said Thursday Hamas was involved in at least two Qassam rocket attacks in the past week along with Fatah and Islamic Jihad. Mofaz stressed nobody will be immune to an IDF response regardless of one's organizational affiliation. See all talkbacks "Baby hurt in rocket attack"